Limpid Jewelry repeatedly produces high quality castings through the application of rigorous process controls and learning through experience. 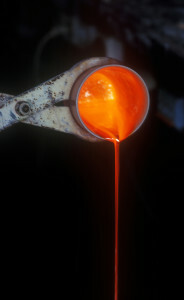 We cast variety of alloys daily and are always working to develop and offer the latest in precious metals casting. Casting is generally done on a next-day basis. Any wax received before 5:00 PM is cast the next day to be available by 12:00 Noon. 1) Call us a day in advance. Same day casting requires planning to be integrated into regular daily workload. Your request in advance makes the process easier and there is a better chance that we can fit the job in. 2) Let us have your wax models before 10 am. Your job is ready by 3 pm. If we have your wax model in time, your casting can be shipped the same day. Premium 18k green: a green as yellow metal can be. Special alloys: these alloys are very easy to cast and makes very clean models. Available in yellow 8k,10k,12k,21k,22k. 12k white. Also available in, 18k & 14k white and yellow spring, Zinc-Free Yellow for enamel. 90% Platinum, 10 % Iridium – It is white, casts wells, works well and wears well. The only limitation is that you can’t stamp it PLAT (without the 90 qualifier). 95% Platinum, 5% Iridium – This metal is white, casts well, but is very soft. It is completely unsuitable for settings or light pieces, and even heavy pieces show wear rapidly. Still, it is the metal we cast the most. 95% Platinum, 5% Ruthenium – The Ruthenium alloy is gives the Platinum a very slight gray color. The metal casts and finishes reasonably well, and is very durable. 95% Platinum, 5% Cobalt – This metal is very slightly blue and is slightly magnetic. We cast Pt/Ru only on special order.